As per newspaper reports, the number of communal incidents all over India in 2018 has been the lowest in the past four years. The Centre for Study of Society and Secularism (CSSS) monitors reports of communal incidents in five newspapers every year. In 2018 the number of communal incidents reported was 38 as compared to 43 in 2017, 62 in 2016 and 47 in 2015 according to the reports in five leading newspapers. Rajnath Singh said that the number of communal incidents has fallen 12% in 2018 (Economic Times, 2018) which supports the finding of CSSS monitoring of communal violence to some extent. Though there is a decline in the number of communal incidents/ communal riots as per the CSSS findings, communal polarization and religious intolerance has sharpened in India in 2018. There is a steady rise in the number of incidents of mob lynching (85) over suspicion of cow slaughter and child lifting and hate crimes according to CSSS findings which also are indicators reflecting the prevalence of communal violence in the country. Further the number of communal incidents has to be problematized. This number is arrived from the reports of only five newspapers and might vary from the number of the Ministry of Home Affairs (MHA) which has better access to comprehensive data of communal incidents. The numbers published by MHA are always way higher than the numbers from CSSS findings. The increase in mob lynching and over all communal violence is attributed to impunity and patronage given to the non state actors by those who are the helm of power. This impunity and patronage have emboldened vigilantes to perpetuate violence. The prospects of justice in the cases related to communal violence were abysmal in 2018. After decades of pursuing and positive role of the judiciary, convictions were achieved in the anti- Sikh riots of 1984 and Hashimpur riots. But overall the state has done very little to secure convictions and justice for the survivors betraying to an extent of bias of the state against certain religious communities. This explains the dominant trend of communal violence in 2018 where the ruling dispensation has been promoting and patronizing violence. The findings of Centre for Study of Society and Secularism (CSSS) are based on its monitoring of communal incidents published in print media reports of Mumbai edition of five newspapers – The Indian Express, The Times of India, The Hindu, Sahafat and Inquilab. CSSS in its reports on communal violence in the past compared its findings with the number published by the Ministry of Home Affairs (MHA). However the MHA has stopped publishing data related to incidents of communal violence. Transparency and accountability in governance are the hallmarks of democracy. In this light the trend of the government ceasing to publish data on incidents of communal violence, which they published until a couple of years back, has blocked out the information of the number of communal incidents taking place in the country according to official sources. Often it is found that the data released by the (MHA) reports substantially higher number of communal incidents than the media reports and thus reports by CSSS. This is natural given the access that the MHA has to all the police stations and subsequently the data. For example, while the monitoring of the newspaper reports by CSSS arrived at the figure of 43 of communal incidents in 2017, the Union Minister of State for Home reported 111 people were killed and 2,384 others were injured in 822 communal incidents in the country in 2017. He also reported that in 2016, 86 people were killed and 2,321 others were injured in 703 incidents of communal violence. In 2015, a total of 97 people were killed and 2,264 were injured due to 751 incidents of riots (The Hindu, 2018). As opposed to this data, CSSS reported 43 incidents in 2017, 62 incidents in 2016 and 47 incidents in 2015. The low figures of communal incidents from CSSS finding may not imply decline in communal violence. Communal incidents are but only one of the aspects of communal violence, only the tip of the proverbial iceberg. Communal violence constitutes communal incidents, mob lynching and hate crimes in today’s context. While communal incidents/ riots come under the category of physical violence, hate crimes may not necessarily be physical violence but predominantly constitute hate speeches, discriminatory attitudes and violence that are perpetuated in a structural manner through institutions. While there are similarities between mob lynching and communal riots, the most salient difference between the two is that in communal riots, the entire ‘other’ community is targeted, but in mob lynching a particular individual or individuals are targeted. These targets are proclaimed by the mob to be guilty of specific ‘crime’ or ‘wrong doing’. Communal riots mete out collective punishment. All members of ‘enemy’ community are targeted even those innocent and believed to be innocent of any wrong doing other than membership of their community. Mob lynching seems to be continuation of that pattern of low intensity communal violence. The innocuous looking isolated incidents of mob lynching are in fact new pattern of low intensity communal violence. The objectives of sustained communal polarization can now be achieved by this method (Engineer, 2018). This report is divided into three sections giving analysis on communal incidents/ riots, mob lynching and hate crimes. In 2018, from 1st January to 31st December, according to the reports in the abovementioned newspapers, 38 communal incidents took place claiming 12 lives and injured 271. Out of the 12 deaths reported, 7 dead belonged to the Hindu community, 3 dead belonged to the Muslim community, the religion of one is not specified and one deceased was a policeperson. Two Hindus killed were Sadhus who were not killed during the communal incident but their death was a trigger for the violence. It was not ascertained who killed them. Amongst the reported injured, 13 were from Hindu community, 6 from the Muslim community, 12 from Christian community, 40 were policepersons and the religion of 200 was not specified. In these 38 communal incidents, 464 persons were arrested. Amongst the 464, religion of 418 is not specified, 34 were Muslims and 12 were Hindus. In 2018 too, the number of Muslims arrested is higher than Hindu arrested. However this year, more Hindus were injured and died compared to the Muslims unlike earlier years where the causalities suffered by Muslims were higher. But the criminalization of Muslims continues this year too. It is no surprise that the trend continues from the previous four years which saw the highest communal incidents in Uttar Pradesh. In 2018, out of 38 communal incidents, 17 were reported from UP. This was followed by 7 in Bihar and 5 in Maharashtra. Majority, in fact 36 out of 38 communal incidents took place in BJP ruled states. Two communal incidents took place in West Bengal which is ruled by Trinamool Congress. 22 states out of 29 in India today are ruled by BJP. 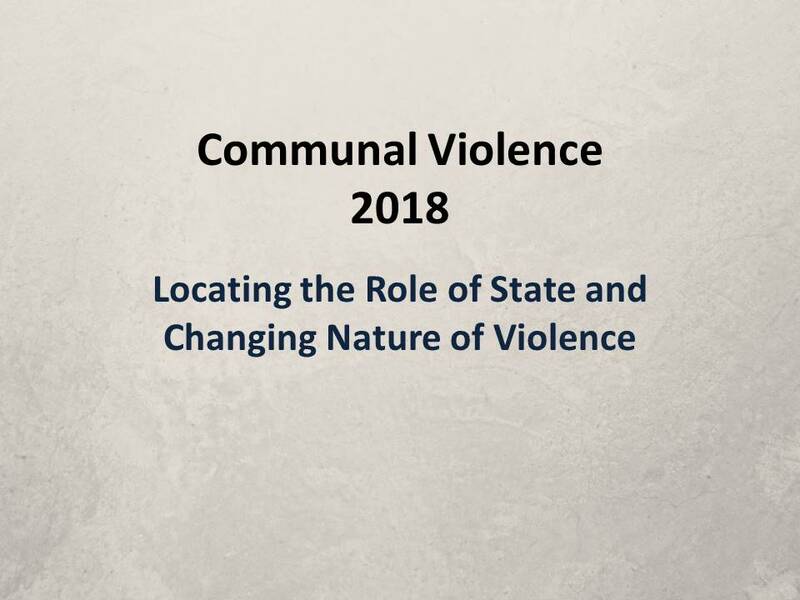 The nature of communal violence has changed in India over the past few years and this change is more distinct in 2018. While communal violence is a broader term, it encompasses communal riots, hate speeches targeting particular religious community, structural violence targeting any community. Communal riot as seen above is when members of one community target the members of another community. The innocent from the community is targeted as a form of collective punishment for the alleged wrong doing of that community. This was predominantly the nature of communal violence till 2014. The scope and intensity of the violence was larger where the number of the deaths was higher and the expanse of the geographical area wider albeit mostly urban areas. This has changed vastly where communal violence has extended to rural areas. As the numbers suggest, over the last few years, the number of communal incidents or riots have gone down. In 2018, the figure stands at 38 as compared to 85 incidents of mob lynching. There are no longer large scale riots but sub radar incidents which doesn’t attract wide media attention or criticism. The incidents are to that extent contained or controlled, enough to polarize the communities and strengthen narratives of conflicts. While the communal incidents have reduced, the incidents of mob lynching by vigilante groups have increased. The number of mob lynching incidents stand at 85 in 2018. That’s more than double of the number of the communal riots/incidents. Here the vigilante groups on mere suspicion lynch the person for some alleged wrong doing of that person himself/ herself. Majority of the lynching have taken place over suspicion of abduction of children followed by cow slaughter and inter religious marriages. The person is subjected to violence because the perpetrators are convinced that the person has committed that alleged wrong. While communal riots requires planning and mobilization in the institutionalized riot system as explained by scholars like Steven Wilkinson and Paul Brass, mob lynching also requires a context and discourse to operate out of. 41 incidents of mob lynching over child abduction and 16 over cow slaughter all over the country are not mere coincidence. The cow as a holy symbol is propagated through the dominant political ideology of the ruling dispensation which is then given legitimacy through legislations in the garb of protection of cows. But the hysteria created around cow and its protection from the “other” (whoever harms the cow is deemed as a threat to the Hindu religion and country itself) creates an environment of impunity and also priorities or symbols of nationalism in the social and political landscape which then become more cherished than human lives itself. The same applies to the suspicion of child abduction. Children symbolically are looked upon as innocent entities to be protected. A narrative was created to plant the idea that Muslims abduct children which was allowed to grow and paranoia was built up to make the situation volatile. The vigilante groups patronized by those in power through hate speeches, openly glorifying such acts or choosing to remain silent when lynching takes place and draconian legislations encourage this state of lawlessness targeting individuals from marginalized communities. This targeting in turn creates a sense of insecurity amongst the marginalized groups. In 2018, CSSS findings suggest that religious festivals, processions and rallies have been the trigger for communal incidents. Out of 38 communal incidents, 20 took place over religious festivals. Reversing the trend from last year, this year social media was trigger only for two communal incidents out of 38 though it was used in various cases for mobilization and spreading rumours. Further the Sangh Parivar outfits were involved in 10 of these 20 communal incidents. Most of them took place in Bihar. In March, in Nathnagar, Bihar, BJP, RSS and Bajrang Dal workers organized a rally led by Arijit Choubey, son of Union Minister, Ashwini Choubey. Some persons complained over loud music and clashes took place. The procession was organized for celebrating Vikram Samvat year. In West Bengal, on the occasion of Ram Navami, two lives were lost when Sangh Parivar outfits were involved in the processions; in fact armed rallies were organized by them in the face of ban by the state government. It is notable that the violence faced by Christians arose out of the opposition to the freedom of the Christians to observe and celebrate their festivals or prayers. Four (4) incidents out of 38 were of anti- Christian violence. In Maharashtra, in Palghar district, a group of Adivasi Christians were targeted after a prayer session and were forced to flee to the jungle for safety. Similarly a group of Dalit Christians was attacked at a prayer gathering where goons entered with sticks and guns at Raikashipur in Uttar Pradesh. In Tajganj, UP, a group of 20 to 25 men barged into the Agra Hotel shouting slogans of Jai Shri Ram. A meeting was organized under the banner of UP family Church to discuss the preparations for Christmas. The women attending the meeting were dragged by their hair and pastors attacked by hockey sticks. In Kowad village of Kolhapur district, a Sunday mass was disrupted by assailants who pelted stones and attacked the attendees. The vehicles of the attendees were vandalized. Two communal incidents that took place perhaps are very insightful about communal violence that takes place with impunity that some outfits enjoy and thus want to demonstrate their assertion in public. The first is the communal incident took place in Kasganj in UP where a flag hoisting programme organized in a Muslim locality was disrupted by a group which undertook a bike rally on 26th January, 2018 without the requisite permission. The youth from the bike rally demanded passage through the Abdul Hameed chowk and demanded the chairs be removed from the chowk. The residents of the locality requested that the youth from the rally join them for the flag hoisting and then allow them passage after the event. But the youth shouting aggressive slogans clashed with the community. The ensuing firing by the police claimed life of one youth from the rally. Second incident took place in Mirzapur in UP where the VHP organized a Ram Janaki bike rally through a minority populated areas without necessary permission. Stone pelting ensued after there was a clash. Though no action was taken against the VHP workers, five persons were arrested on the complaint of the VHP. The festivals and rallies are organized by the right outfits to demonstrate their assertion and superiority in Muslim dominated areas to instigate violence. Adequate police action is not taken against the perpetrators. This gives the perpetrators a sense of security and emboldens them to carry out more such rallies. Two communal incidents took place over social media. Like mentioned above though social media is used in most cases for mobilization and spreading rumours, in these two incidents, social media and more specifically objectionable videos/posts were the direct trigger for communal incidents. In Agastyamuni in UP, a fake video was circulated alleging that a 10 years old Hindu girl was raped by a Muslim man. Though it was made clear later that this video was fake, 15 shops belonging to Muslim traders were vandalized by agitators including people from the traders’ body, a local students’ group Jai Ho and members of the ABVP. In another incident, Surbhog in Assam, a post was uploaded on facebook with words like Pakistan Zindabad. It was found later that the account belonging to Ahidul Ali, a local butcher was hacked by Jyotish Nath who had a personal enmity with Ali. Ali’s shop was vandalized and part if it burnt. Later an inebriated crowd shouted slogans of “Bharat Mata ki Jai” and “Jai Shri Ram”. Like mentioned above, earlier communal riots was largely an urban phenomenon. Now the violence engulfs the rural areas as well. While northern India and especially Uttar Pradesh has remained the hotbed of riots over the years, there is communal tension fomenting in the other parts of the country, namely West Bengal, Bihar and Kerala. It is interesting to note that West Bengal and Kerala are states not ruled by BJP and in Bihar BJP recently entered the ruling alliance. Starting with West Bengal, there is a strong rhetoric of TMC supporting migration from Bangladesh coupled with the allegations of appeasement of Muslims. In the highly competitive arena of electoral politics in West Bengal, the TMC and BJP have locked horns. The BJP to win over the Hindu votes is polarizing the religious communities in the state especially through the medium of festivals. Clearly the Sangh Parivar is aggressively mobilizing for polarization. Two communal incidents took place in West Bengal and the involvement of Sangh Parivar outfits in both the incidents was evident and reported. In Purulia, on 25th March, the BJP and Bajrang Dal workers were involved in the communal clashes which claimed life of one youth. In the other communal incident, in Asansol in West Bengal, clashes broke out during Ram Navami celebrations with the support of VHP. Loud music played in the rally led to altercation claiming one live. In the face of the brutal death of his son Sibtulla Rashidi, a Muslim imam, Maulana Sindadul Rashidi appealed for calm and peace which averted more violence. Similarly, at the base camp of Sabarimala, the RSS has mobilized supporters to ensure that no women can enter the Ayyappa shrine albeit the Supreme Court judgment which allows women to enter the temple. The RSS opposition to the women’s entry is a stand to again position itself as the representatives of the Hindus in the state and gain electorally from the polarization in this state which BJP never ruled. In Bihar, it is reported that, since July 2017, when the JD(U) led by Nitish Kumar broke its alliance with the RJD-Congress and went back to the NDA, there have been 200 incidents of communal tension, as many as 64 this year alone, a scrutiny of official records by The Indian Express reveals. Compare this with data of the last five years: 50 such incidents in 2012, 112 in 2013; 110 in 2014, 155 in 2015, 230 in 2016. At 270, 2017 recorded the highest number of communal incidents in recent times (Singh, 2018). Thus there were 64 communal incidents till April 2018 itself. According to the findings of CSSS, 7 communal incidents took place in Bihar in 2018. This violence is used as a weapon to make inroads electorally in Bihar keeping an eye on the 2019 general elections. The role of the police was largely partisan in the incidents of communal violence. In the communal incident of Aurangabad in Maharashtra, the police was seen walking with the perpetrators and protecting them in videos that were circulated on national television. The police in the cases of mob lynching are seen walking in front of the mob which is dragging the injured victims like in Hapur or remaining mere bystanders. In the case of Alwar mob lynching, the police stopped in the way to have tea and wasted crucial two hours taking the victim, Rakbar Khan to the hospital who eventually succumbed to his injuries. The ruling dispensation also used the state machinery like the NIA to probe if “love jihad” is a medium to trap innocent Hindu girls, convert them into Islam and mobilize them for terrorism. This investigation was ordered in the wake of Hadiya case. It is unthinkable and clearly betrays the bias and attempt to stigmatize and demonize the Muslim community by those in power by deploying state machinery to strengthen the myths against the community. Similar example is that of the national register of citizenship. By setting up arbitrary procedures and demanding impractical proofs of citizenship, the state has left 4 million residents of Assam out of the ambit of citizenship and rendered them stateless. Most of them are from socio-economically marginalized groups and driven to the point of suicide in the quest to prove their citizenship. The latest action of the state that caused shock and outrage was the Noida police asking the companies to direct their staff to not offer prayers or Namaz in public spaces particularly in the Noida park and employers will be held liable for Friday prayers by their staff in the park. This discriminatory move has larger ramifications on the principle of equality and also on the employment prospects of the Muslim community. The state and more specifically the executive is responsible to ensure that the rule of law should be implemented strictly and that law and constitutional values shapes the public discourse in the country. The state is also accountable and responsible to protect equally the right to life of all citizens. Unfortunately the executive and some in the legislature/ elected representatives were seen blatantly promoting the culture of impunity. The political ideology and considerations of electoral gains were the driving force behind the action of the executive and legislature. The heightened number of cases of mob lynching which came up with alarming regularity were not merely isolated cases but part of a diabolic and violent ideology upheld by the executive with an objective to polarize and strike fear in the hearts of the marginalized communities. The significance attached to cow and making it a litmus test for nationalism gave a free hand to the vigilante groups. While human lives were lost both from Hindu and Muslim communities, the state took no strict action against the vigilante groups. Even when the a police personnel, Subodh Kumar Singh was beaten to death by a mob over suspicion of cow slaughter in Bulandshahr, the Chief Minister of Uttar Pradesh ordered for strict action and speeding up arrests for cow slaughter but remained quiet over the murder of the cow (Pandey, 2018). This gave out a clear signal that vigilantism is accepted by the government if it achieves its political agenda and rule of law can be neglected. The lack of action of the executive against those indulging in communal violence- both communal riots and mob lynching is creating a culture of impunity where the perpetrators are fearlessly flouting laws since they are aware and confident that they will not be punished for their acts. No major convictions took place in 2018 in the crimes that took place in the same year or the preceding year. In fact, the government of UP sought to withdraw 133 riot related cases, some of the accused include local BJP MP Sanjeev Balyan, BJP MLAs Suresh Rana and Sangeet Singh Som, VHP leader Sadhvi Prachi- all holding constitutional positions and bound to protect constitutional values. This is misuse of power and sets a wrong precedence as far as the objectives of accountability and justices are concerned. The role of the ruling dispensation has been that of patronizing violence and non state actors who perpetrated violence. The perpetrators of the violence feel emboldened to indulge in violence since the powerful are shielding them and giving them direct and indirect patronage. This can be illustrated with some examples. Firstly, the examples of Jayant Sinha and Giriraj Singh, both Union Cabinet Ministers- Jayant Sinha felicitated cow vigilantes who were convicted of killing a meat trader in Jharkhand. Giriraj Singh, BJP MP visited Nawada district jail and met Bajranj Dal and VHP members who are accused of inflaming communal passions. He went to the extent of stating that these accused were implicated in false case (Kumar, 2018). In effect it implies that the elected representatives who hold highest constitutional posts give a clean chit to accused of communal violence before the judiciary can give its judgement on one hand and on the other laud convicted persons the judiciary found guilty. This amounts to endorsing and patronizing such vigilante elements that undermine law and order. In many cases the right wing outfits indulge in violence openly on the cue on the hate speeches given by those in power or the powerful supporting them. In the case of Gurgoan, a Friday prayers were disrupted in different parts of the city by Hindutva outfits who shouted slogans like Jai Shri Ram and Bangladeshi wapas jao. Local unit of VHP also threatened to disrupt namaz at open places if the police didn’t take action. In another incident, a couple from different religious communities were harassed and manhandled, allegedly by a group of BJP workers, outside the sub-divisional magistrate (SDM) court in Bijnor, western UP, when they had gone there to submit their marriage certificate on Thursday. One of the two named in the FIR is the district BJP vice-president. This incident is a manifestation of the aggressive propaganda of ‘love jihad’ carried out by the government. A case bordering on discrimination by the government as well as giving obvious patronage is the case of kanwariyas. In Khailam in UP, the UP government spent INR 14 lakhs on choppers to track the yatra where the police was seen showering rose petals to greet the kanwariyas. The aggressive sloganeering of the Kanwariyas led to communal tensions and sense of insecurity in the Muslim dominated village. Instead of allying fears, the police issued red cards to 250 locals! The Kanwariyas in other places and instances had vandalized vehicles in Delhi and attacked car followed by looting it in Muzaffarnagar. It is found generally in communal incidents and particularly in the last couple of years that the marginalized communities that are targeted in the communal incidents are not only denied justice in terms of prosecution and punishment meted out to their culprits but injustice is done by doubly victimizing them. This is done by taking punitive action against them on one hand and taking very little or no action against the perpetrators on the other hand. For instance, in Muzaffarnagar village in UP, 27 men from the Muslim community were arrested amongst them three under the stringent National Security Act (NSA). It was alleged that they led an attack on Purbaliyan’s Hindu community. It was further alleged that the youth from the Muslim community were picked up arbitrarily. These arrests preceded a hate speech by BJP MP from Muzaffarnagar, Sanjeev Balyan who urged the administration to press charges under NSA and the Muslims harassed the Hindu Pal community. In Bahraich too, in a clash that took place over procession of Durga idol immersion, FIR was filed against 80 Muslims and 100-200 unnamed people. Unlawful Activities Prevention Act was invoked against the accused. No FIR was filed against the other group which is seen chanting ‘Jai Shri Ram’ and threw gulal inside a Mosque. Revictimization is seen particularly in the cases of mob lynching over suspicion of cow slaughter. As seen last year, Pehlu Khan was lynched but a charge sheet was filed against him alleging that he did not have the necessary permits to transport the cattle. In 2018, in the Hapur mob lynching, the police drew flak for its shoddy investigation and the delay in filing of the charge sheet (Rai, 2018). The intimidation continues to deter the families of the victims as was seen through the attack on Pehlu Khan’s sons and other witnesses who were on their way to depose in the sessions courts in Alwar. In another incident of revictimization in Shamli, UP, large number of vigilantes stopped a mini truck carrying two cows. They pulled out the vehicle’s crew and attacked two men from the minority community in front of a police constable for allegedly trying to smuggle cows for slaughter. The police was mere spectators and have filed a case against the victim along with those who attacked. Recently Sagir Khan was lynched by a mob over suspicion that his vehicle carried cows. Khan tried to flee in his vehicle but was waylaid and beaten up by the villagers. The police have filed a case against Sagir for cattle smuggling. This article is a part of Communal Violence Report 2018. Read Part Two here and Part Three here.